Above: Julie Carlson, editor-in-chief of Remodelista. Photograph by Matthew Williams. In the lead up to our launch of Fabulous Fabsters, I have been keeping a list of inspiring FAB (Fifty And Beyond) women whose stories I’d like to share. And as the list keeps growing, the subject of my inaugural post has always held firm. I am deeply honoured that Julie Carlson, editor-in-chief of the interiors website Remodelista and a good friend for many years has agreed to go first. Because without Julie, Fabulous Fabsters might never have come about. Let me explain. From blog to brands, Julie has transformed her obsession with home design into one of the leading authoritative voices on the interiors landscape today — all in less than 10 years when she started Remodelista in 2007 with three friends around her dining room table in Mill Valley, California. And in this period, she also managed to co-found sister site Gardenista — her solution to extending her design interests to the exterior. 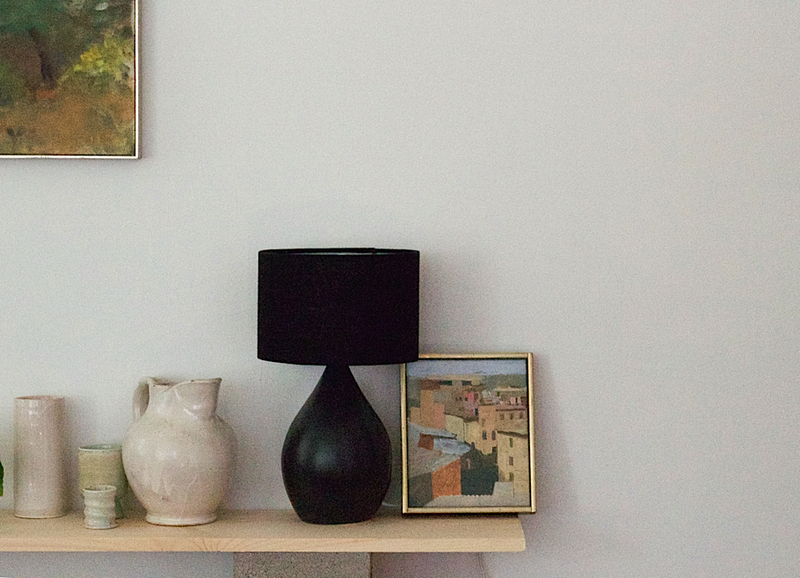 About 5 years ago, Julie asked me to be Remodelista’s London Editor. I was an architect living in London who had taken time off to raise my children with next to no internet experience and limited writing skills. I approached with trepidation. As a friend, her complete faith in me and willingness to watch over my development were invaluable. She led with her talented example and gentle guidance. I followed and flourished, or so she tells me. It was important to Julie that her editors work hard to find their voices and she encouraged us consistently. This was her gift to me. 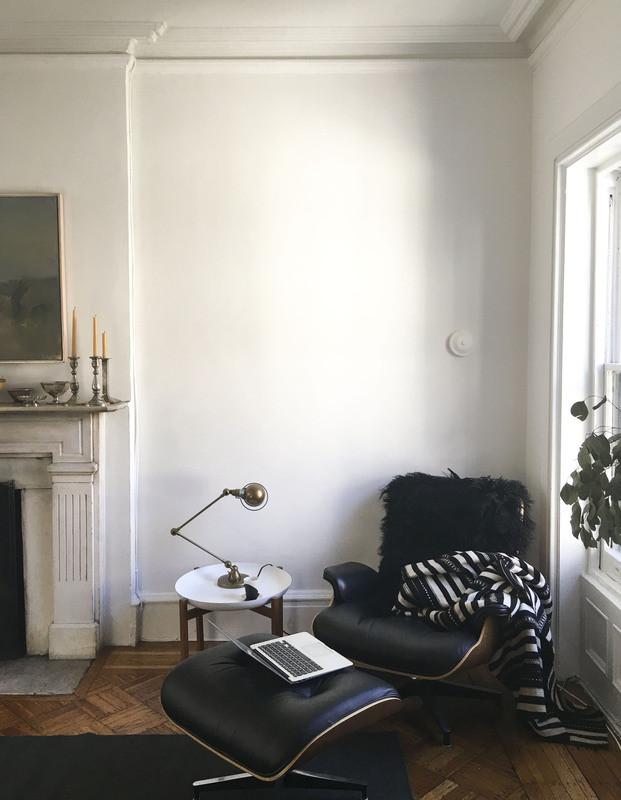 Above: Julie’s new office in the corner of the living room of her top floor flat in a Brooklyn brownstone is comprised of the Iconic Eames Chair, a Remodelista exclusive Jielde SI333 Signal Desk Lamp and a laptop. Photograph by Julie Carlson. And through all our Skype meetings — no easy feat with an eight hour time difference — we continued to connect as friends. We first met sixteen years ago when Julie and Josh, her husband and business partner, moved to London for a few years with their two children who are the same ages as mine. In London, we watched each other’s kids start school for the first time and over the internet, we watched them grow and leave school when they graduated. For the last few years, I have noticed a restlessness in Julie as she kept talking about her desire to be back on the East Coast where she had grown up. With both of her children in East Coast colleges and universities, it was no surprise to me when she told me last year that she and Josh were downsizing and moving from Mill Valley to Brooklyn. Having moved twice since September from temporary rental accommodations to less temporary rental accommodations, they are not yet completely settled. And yet when I visited them over Christmas only a week after their second move, I was in awe of how Julie has appeared to magically recreate the spirit of her Mill Valley home on the top floor of a Brooklyn brownstone. Join us as we talk about what it means to downsize, move across the country and make a new home. 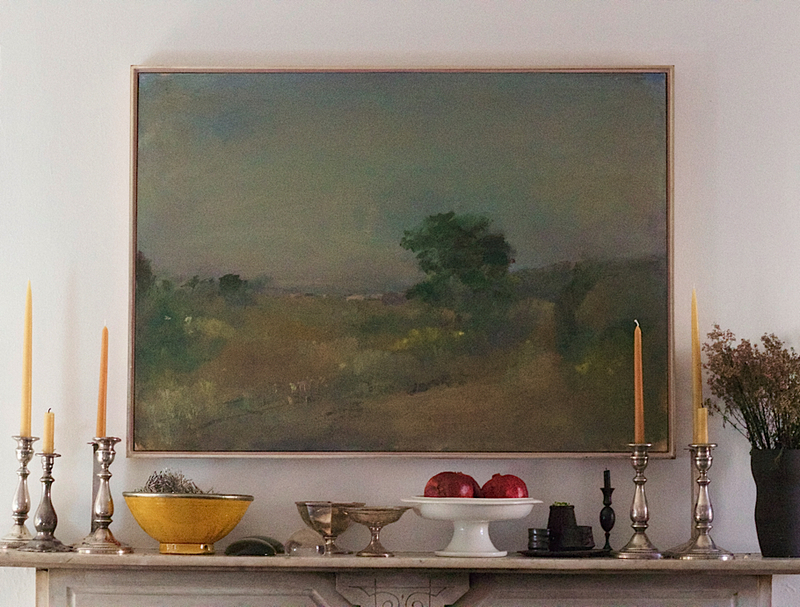 Above: A painting by Cape Cod artist, Robert Dutoit who was a great friend of Julie’s mother, hangs above the Victorian fireplace mantel. FF – You’ve turned your passion for home design into a successful business. What prompted this interest and why do you think you became so obsessed? 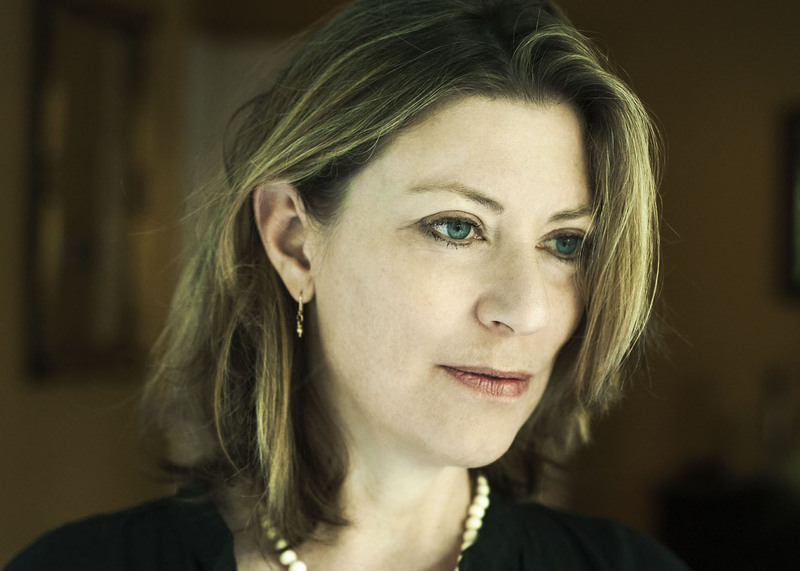 JC – I’ve always been attuned to my domestic surroundings; the mark of an introvert. So when my husband, Josh, and I bought our first house, a small ranch house in the beach town of Del Mar (we lived there for three years after Josh finished business school and took a job at a San Diego tech company), I went into a remodeling frenzy. We painted the knotty pine paneling white, redid the tiny kitchen, and added French doors to open the space to the outdoors. The results were so dramatic and life changing that I was emboldened to go even further with our next remodel. We worked with San Francisco-based architect Jerome Buttrick, one of our great friends, on the project in Del Mar, and when we relocated to Mill Valley with our two young children, we of course turned to Jerome to overhaul our new and charmless 1970s ranch house. After finishing the second remodel, I felt like I had accumulated enough sourcing information to fill a book. My oldest friend, Francesca Connolly, had also just finished a remodel. We consulted constantly during the process and then ended up spending a whole summer in Wellfleet, on Cape Cod, talking about how there had to be an easier way. Blogs were beginning to proliferate, so we decided to create the ultimate remodeling resource guide and share our hard-won knowledge with a wider audience. There are so many options — it’s difficult to know what to choose and why, which makes the process even more arduous. The blog is meant to simplify these decisions by presenting the 10 best options in any category: from light switch covers to kitchen faucets to subway tile. Above: Silver candlesticks donated by Josh’s Aunt Pat with beeswax candles are paired with a Morroccan bowl that Julie bought on a trip to Nice twenty years ago. FF – What previous experience did you bring to Remodelista? JC – I studied English and American Literature at Brown, but I also took a full load of art history and architecture classes; we had an inspirational professor called William Jordy who really ignited my interest in architecture. After college I worked in magazines; my first job was as a copy editor at The New Yorker; after I moved to the Bay Area with Josh, my husband, I freelanced as a design editor and was the style editor at San Francisco Magazine. All of this came in handy when we launched Remodelista; from the beginning, I wanted our site to have a professional polish; many of the early blogs were pretty free form, so I think this helped us stand out. 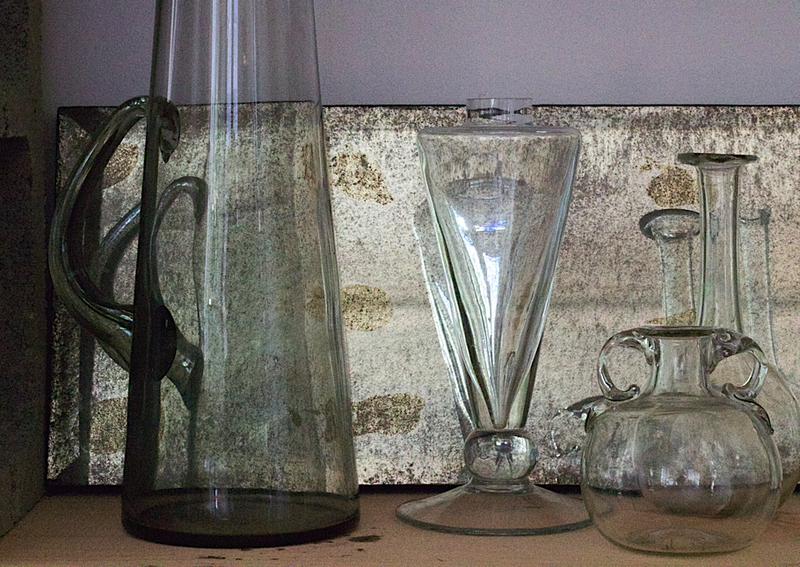 Above: Patina and texture result from placing glassware from John Derian in front of a foxed mirror which Julie purchased in a sidewalk sale from Oly Studio in Berkeley many years ago. FF – You recently relocated from Northern California to Brooklyn; what prompted the move? JC – With two children in college back East (one at Brown and one at Bard), the timing was right. Both Josh and I have been wanting to spend more time in NYC, both for business and family reasons, so we decided to take the plunge last spring. We rented out our Mill Valley house to a fantastic couple from–where else–Brooklyn (they have school-age children) and rented an apartment in Brooklyn Heights. It was important to me to find a space with a lot of light; I’m hopelessly spoiled after two decades on the West Coast. Our current flat is on the top floor of a classic Brooklyn brownstone with lots of period details; marble fireplaces, parquet floors, original cast iron radiators. 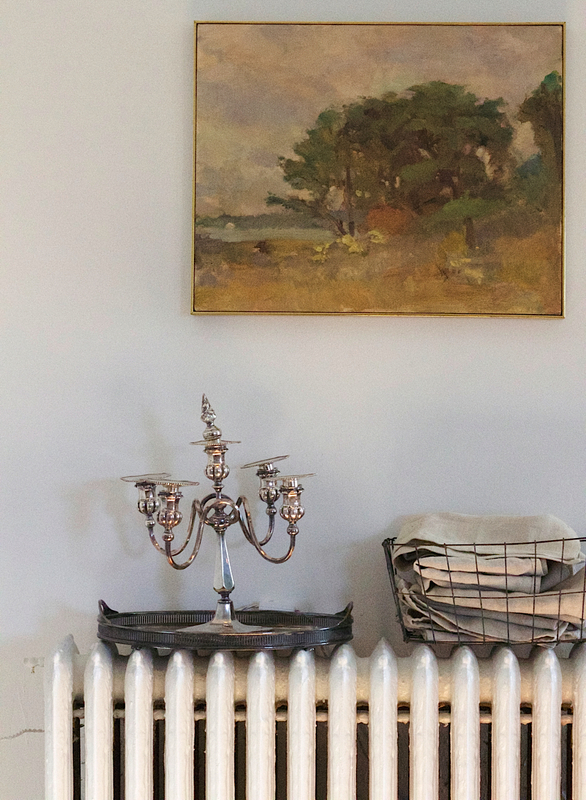 Above: Another painting by Robert Dutoit hangs above the apartment’s cast iron radiators. Belgian linen napkins from Libeco are stored in a wire basket. 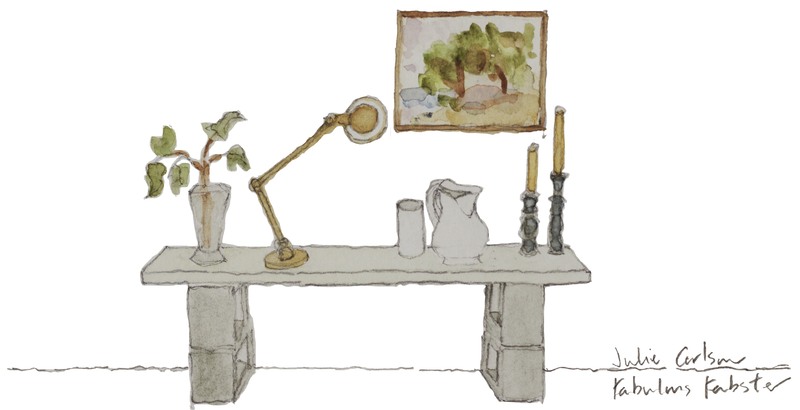 FF – What do you think is important in creating a home? JC – Our mantra at Remodelista is “classic and livable trumps trendy and transient”; in my case, that means a mix of midcentury furniture, inherited silver from my husband’s side of the family (both his mother and aunt have caches of wedding silver that I’ve raided), paintings from my side of the family (my mother collected work by Cape Cod artist Robert Dutoit). Nothing too fussy or fancy; in fact, I currently have a cinder block and wood plank bookcase in our Brooklyn flat. It will be a placeholder until I figure out whether to install real shelves. Or it might just stay as is. I do think you need a unifying palette, though; in my case it’s black, green, and natural tones (with a bit of dusty pink thrown in via velvet pillows from Kirsten Hecktermann). Texture is important, too; I like a mix of, velvets, wools, leather, and sheepskin. 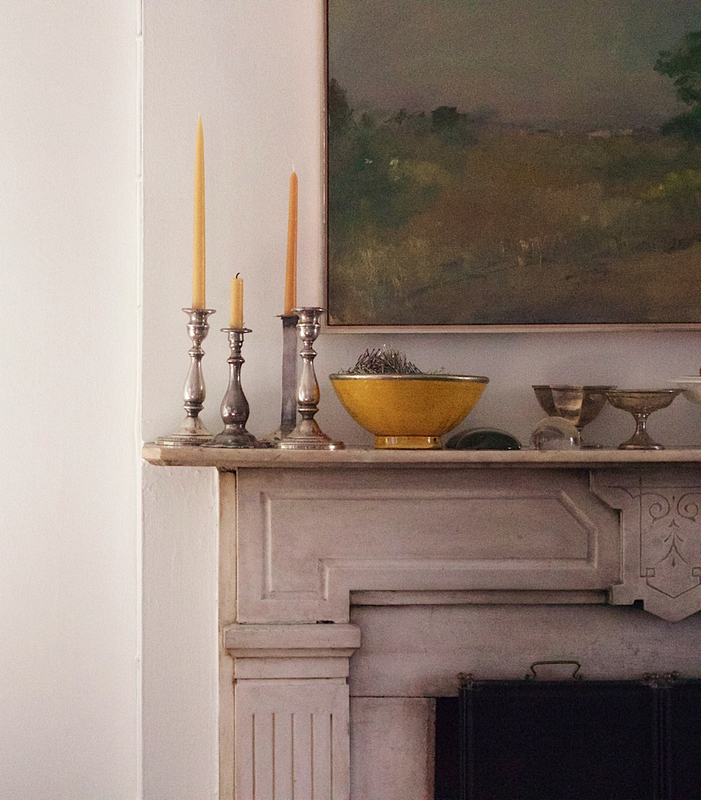 FF – We have often written on Remodelista about downsizing as an opportunity to de-clutter and rid oneself of accumulated detritus; in what ways have you been successful (or unsuccessful)? JC – I haven’t accumulated all that much over the years, partly because we’ve lived in relatively small houses. And I haven’t lived with enormous closets, which forces you to really think about bringing anything new into the house. I did struggle with what to do with children’s toys, art work, favorite pieces from their childhoods when we packed up our Mill Valley house. A lot of that is in storage right now. With my own stuff I’m more ruthless. Above: Julie’s plates from Bennington Pottery in Vermont, which once belonged to her mother, made the move and are part of her kitchen staples. FF – Does greenery play a big role in how you decorate a space? JC – I have to admit I am very lazy about house plants; I like to buy a big bouquet of eucalyptus and call it a day. 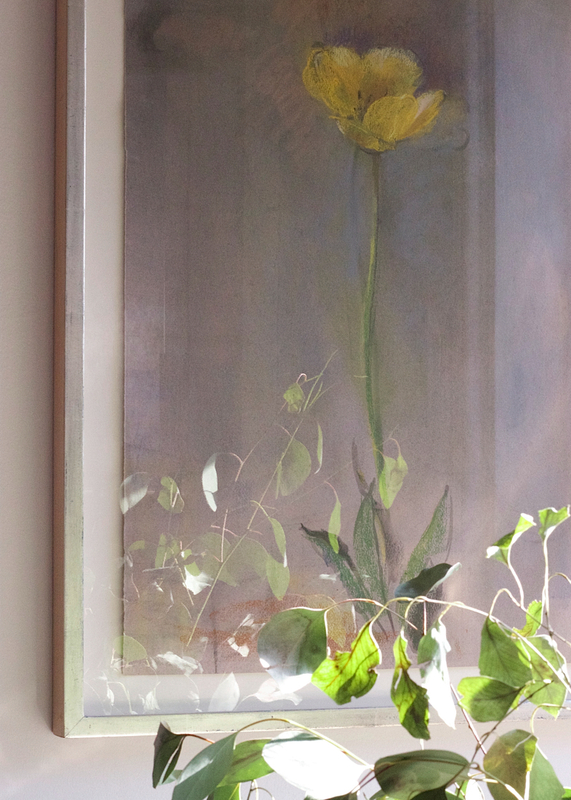 I learned a big lesson from John Derian; he displays dried/dead floral/plant arrangements all over his house in Provincetown. FF – What’s in your Prescient Pantry? Go-to meals? JC – I confess that I’ve been cooking less with both children in college; I usually make a simple pasta at night. I always like to have good sea salt, olive oil, and deCecco pasta in the pantry. 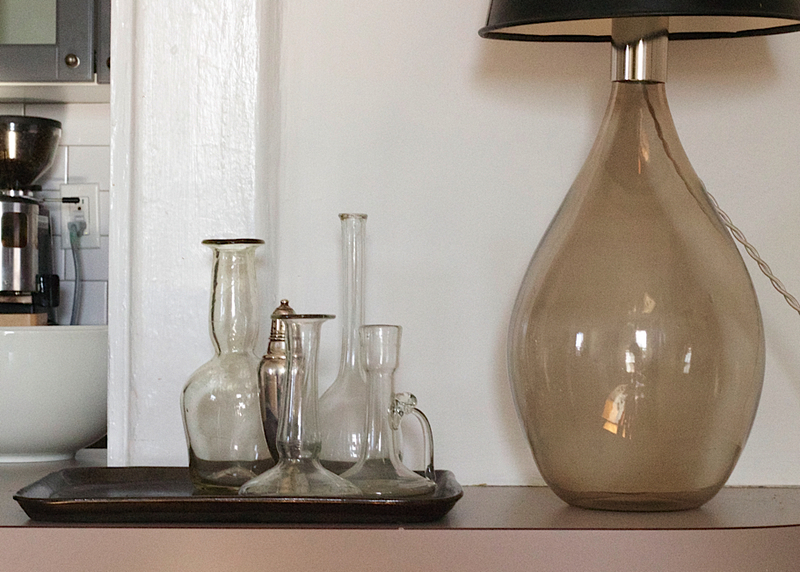 Above: A hand blown glass lamp from Ochre and glass vases from John Derian in Provincetown create another still life of loved objects. FF – Any wardrobe wisdom? Favorite shops? JC – I’m a big believer in the uniform; for me, it’s navy blue and black dresses and shirts from Sofie d’Hoore, a Belgian designer we’re all obsessed with at Remodelista, mixed with jeans and clogs from No. 6. I’m a big believer in comfort, too; I refuse to wear too-tight shoes or anything that doesn’t feel good against the skin. When I was younger I was willing to sacrifice comfort for style; no more! 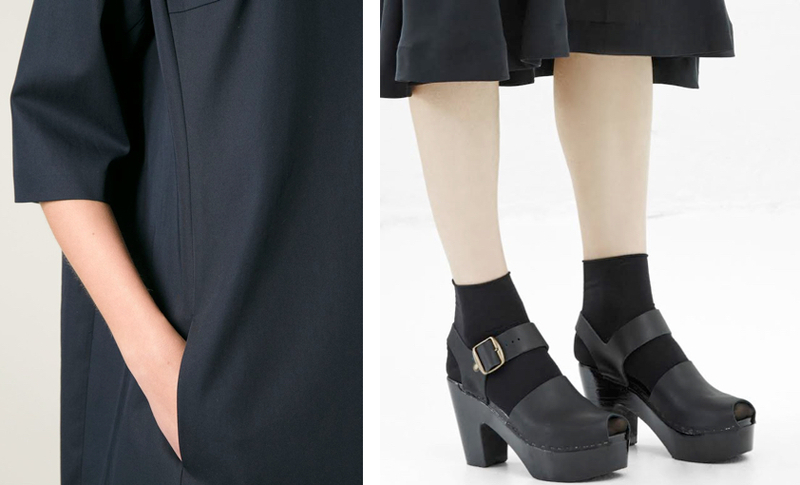 Above L & R: Julie’s uniform — a dress from Sofie d’Hoore and a pair of clogs from No. 6 Store. 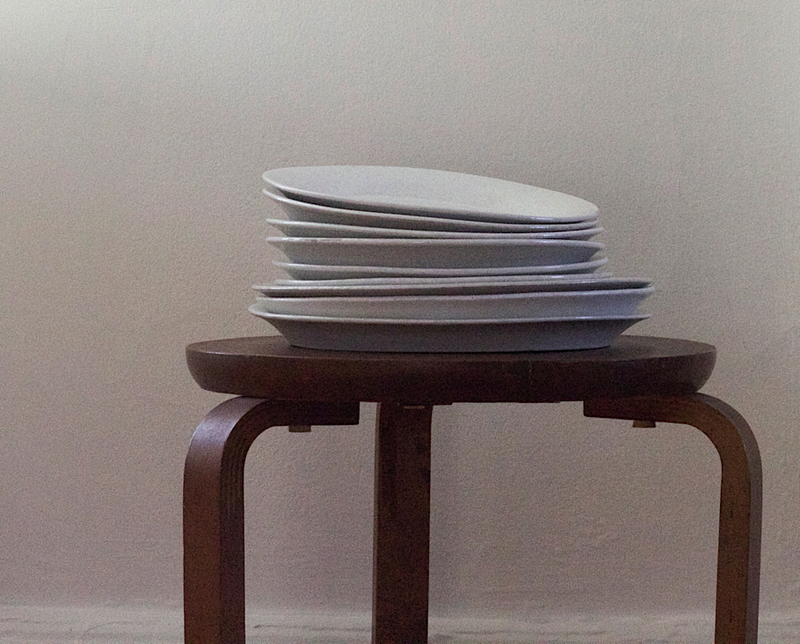 FF – Remodelista and Gardenista have recently gone through a redesign. What else can we look forward to? JC – Following the success of our first book, Remodelista: A Manual for the Considered Home, we have been working on two more. The Gardenista book is coming out in Autumn 2016 and The Remodelista Guide to Artful Organization is due for 2017 (date TBD). And in the immediate future, we’ll be holding our first independent New York Remodelista market over the weekend of March 12th and 13th at the Canvas Home store in Chelsea. We’re excited to make our big city debut; we hope we see all your readers there! 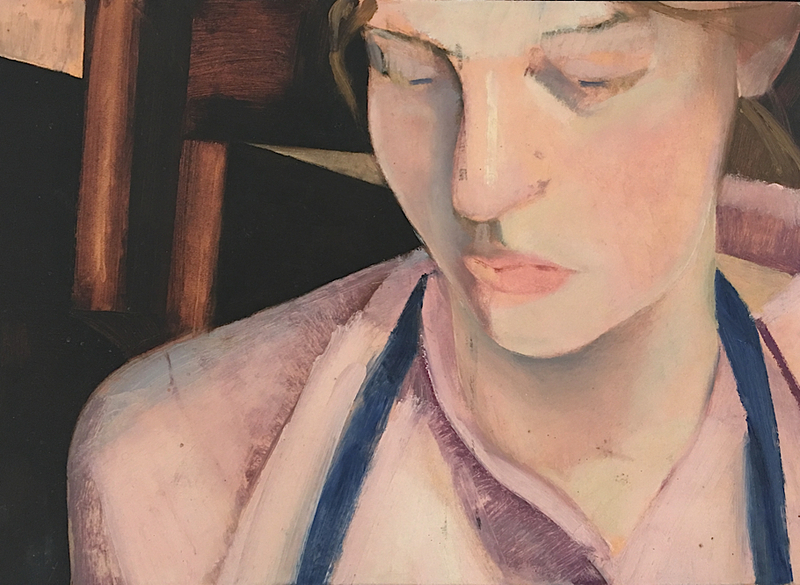 Above: A portrait of Julie when she was 16, painted by Helen Miranda Wilson, a Cape Cod painter who is the daughter of famed literary critic Edmond Wilson. Above: Julie’s still life. Artwork by Christine Chang Hanway. A Fabulous Fabster thank you to Julie Carlson! Thank you for this! And is this your drawing at the end, Christine? It is indeed, Kendra. One of my favourite things about this is capturing the spirit of a Fabster with a drawing. Thank you! Thank you so much, Deborah. I feel very grateful for your support. What a great interview! I’m looking forward to reading your next one! Thank you so much. I’m looking forward to writing it. I have a special one coming up on Valentine’s Day all the way from Northern Ireland! Oh, this is great. I look forward to more. Thank you, Roslyn. Lots more to come! Best.